It's done! The last of my Boyne Berries was launched last evening in the Castle Arch Hotel, Trim. It was a most enjoyable function and I was delighted at how well it went and how well those who attended seemed to enjoy it. Paddy Smith as MC was his usual bright self with plenty of attempts at humour, most of which worked well! He suggested that Fr Sean Henry, who launched the issue might give a general absolution to writers present who do such violence to the English language in the work! The local PP, Fr. Sean Henry, then officially launched the issue and complimented the group on their work in the community and on the publication of the magazine. He spoke of the importance of the word, of reading and of books and mentioned his own love of poetry. Emily Dickinson is one of his favourites. Then the readers. A total of seventeen contributors read. As well as the locals they came from Louth, Cavan, Dublin, Longford and Kildare. A great variety of material, prose and poetry and some nice humour as well. Sometimes these occasions see a lot of "serious" stuff read but last night there was plenty of laughs as well. The night ended with presentations of framed prints of Greg Hasting's cover image to Fr. Henry and to myself as retiring editor. Orla Fay, incoming editor, made some very kind remarks about my tenure as editor and told us how excited she was to be taking over. Then I was delighted and surprised to be presented with a beautiful Children of Lir by Genesis, Mullingar on behalf of Boyne Writers Group to mark my retirement. Thank you all very much. Top: Paddy Smith presents the Children of Lir on behalf of Boyne Writers Group. 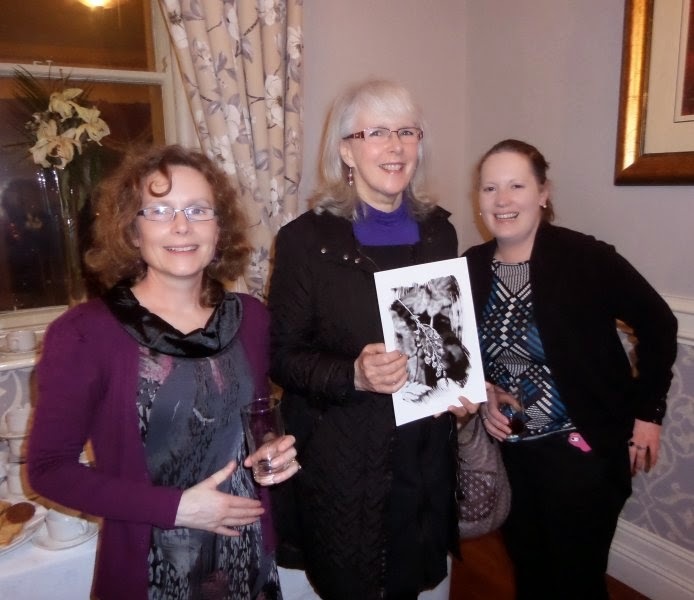 Middle: Orla Fay presents a framed copy of Greg Hasting's cover image. Bottom: Sharon Tighe Mooney, Mary Melvin Geoghegan and Orla Fay at the launch. The latest issue of Boyne Berries magazine will be launched on Thursday 27 March at 8pm in the Castle Arch Hotel, Trim. 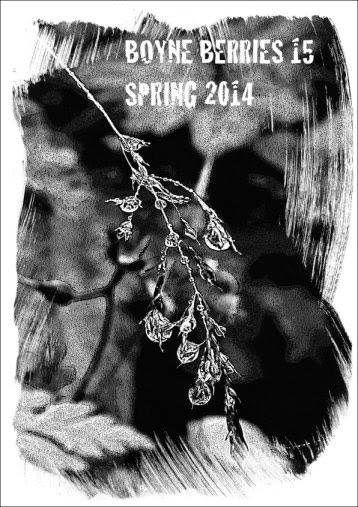 This is issue 15 of the magazine, which has been published twice yearly by Boyne Writers Group, Trim since 2007. This issue has contributions from various parts of Ireland, the UK and the USA. 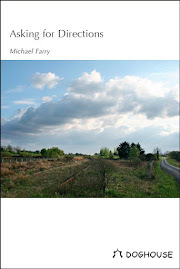 This is the last issue under the editorship of Michael Farry, a founder member of the writers group and editor since the beginning. Having successful edited fifteen issues Michael has decided it’s time to pass on the responsibility to some one else. Orla Fay from Dunderry, a long-time member and well-published poetry and prose writer is taking over. The seventy pages of prose and poetry in this issue reflect a wide range of topics. A quick glance at the titles gives a flavour of the variety of the contents: Accordion Lesson, An Existentialist’s Wedding Vows, McDonalds Saturday Afternoon, The Snaring of the Snark, The Harpist at the Top of Grafton Street, Loughcrew, The New Curtains and The Hayfield. A feature of this issue is the number of pieces which deal with ageing and dementia. 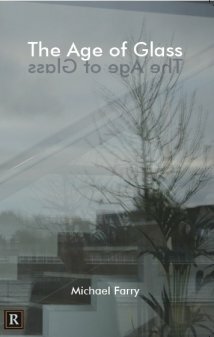 Andy Jones wonders why he bothers planting an tree – Ten years will see me planted as sure as the Acer, Noel Carey’s poem on an old woman, possibly his mother, has the ironic title The dignity of life and Monica Corish titles her poem about a parent dying The Road Rising to Meet You. There is also humour; a short story, Cathy Conlon’s Gran’s Shopping Trip, tells of an expedition to Cleary’s with Granny to buy a present for her ninety third birthday. Gran proves quite a handful and a misunderstanding about the meaning of the word “wardrobe” results in her getting something she didn’t want! And there is plenty of humour elsewhere in the magazine. Dawn Lowe’s science fiction story The Chairwoman involves a female explorer from the planet Chair attending a writers group meeting with hilarious consequences. Louisa Moss from Trim has a short, amusing, cynical gloss on Dorothy Parker’s famous lines: Men seldom make passes /At girls who wear glasses. Caroline Carey Finn’s story House of Cards is a hilariously whacky account of the first day after a divorce settlement. She held on to the pub! The passing of Seamus Heaney is marked by a poem from well-known midlands poet, Mary Melvin Geoghegan. Entitled A Response to Hearing Mid-Term Break Again it pays homage to one of Heaney’s best-known and best-loved poems. Padraic O’Dowd from Boyne Writers has a poem about the experience of soldiers in the trenches during the First World War, The Enlisted. Margaret Galvin from Wexford writes about donating an item from her wardrobe to charity: My wedding suit is gone off/ in a truck to Belarusse/ among bales of old curtains/ and sacks of wellingtons. Many of the contributors will attend and read their work at the launch. All are welcome to attend the launch and admission is free. Previous launches have been very enjoyable occasions and have been very well attended. Boyne Berries 15 costs €8 but will be on sale at a reduced price at the launch. It will also be available in Antonia’s Bookshop, and in SPAR, Trim. Copies can be purchased on the group's webpage. The latest issue of Boyne Berries magazine will be launched on Thursday 27 March at 8pm in the Castle Arch Hotel, Trim. This is issue 15 of the magazine, which we in Boyne Writers Group, Trim, have published twice yearly since 2007. 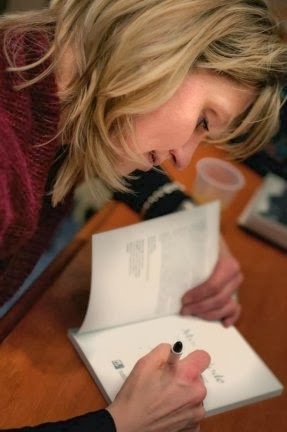 As with previous issues the publication includes poems and stories by local writers authors and those from far away, first-time authors and well-published authors. This issue has contributions from various parts of Ireland, the UK and the USA. This is the last issue under my editorship. I felt it was time to pass on the work and the enjoyment to another and I'm delighted that Orla Fay is taking up duties from issue 16. Orla Fay is a long-time group member and well-published poetry and prose writer. I have enjoyed my years as editor. I've made lots of friends all over the work and was delighted to publish work from new writers and well established ones. It did involved a lot of work, everything from sending out the call for submissions to compiling a print-ready pdf for the printers. I've had great support from the group over the years and am very grateful to have been entrusted with the task. I've learned a lot during my time as editor - a lot about writing, a lot about submitting to magazines and a lot about writers. I must expand on that at some stage but not at the moment. I have to prepare for the launch on Thursday. Our launches are usually most enjoyable. We get audiences of between 40 and 60 usually with lots of contributors attending and reading. As well as those who travel long distances from far flung parts of Ireland, Cork and Galway for instance, we have had poets from Canada, the USA and the UK attending and reading. So I'm looking forward to a good launch on Thursday. Cover of Boyne Berries 15 above, cover image, as for each previous issue, by Greg Hastings. The afternoon will see announcement of the winners of the Hanna Greally Literary Awards for 2014, entries for which are now being accepted. The closing date is Friday, 10 October. Entries may consist of poetry, prose, short stories (maximum 60 lines or 300 words) on any subject or theme. 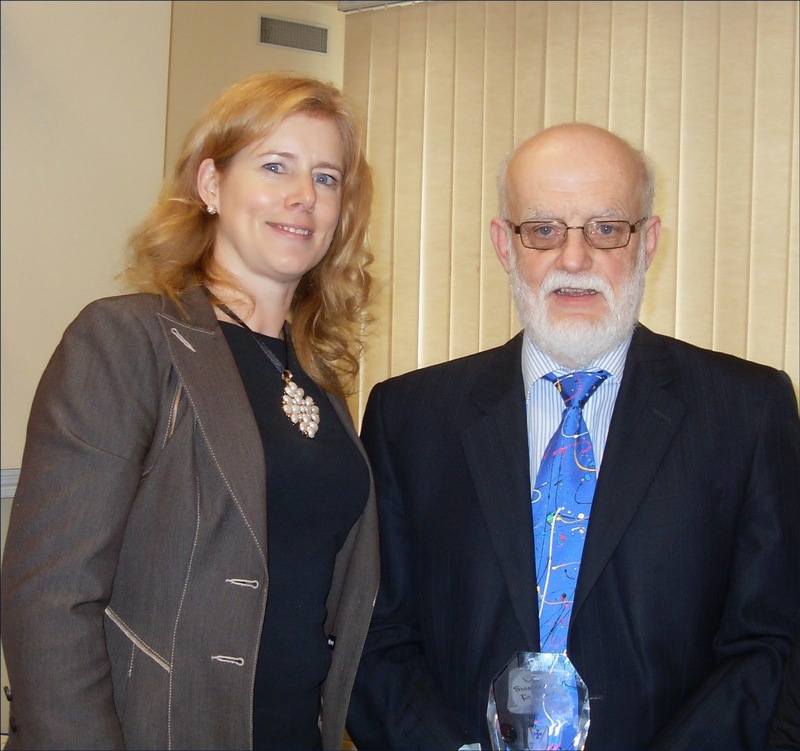 I was lucky enough to win this competition last year; picture of presentation by judge, Eleanor McGrath, above. The annual Ger Hanily Memorial Cup, which forms part of the awards ceremony, will be awarded to the best entry on the theme of Coman's Wood. The incentives for entrants to this years Hanna Greally Literary Awards, includes cash prizes, trophies and certificates. The overall winner will come away with a €1,000 publishing services package from The Manuscript Publisher, the Irish-based publishing solutions provider. The prize is designed for self-publishing authors and independent publishers. It will result in the winning entrant having his or her book published, in print and e-book format, with full editorial, design, ISBN registration, sales and marketing support. In the afternoon, a writers workshop with Mario Corrigan will be hosted, on the subject of Writing for Children: Historical and Mythological Adventures. More information about SiarScéal Festival 2014, including the full Programme of Events and competition entry details for the Hanna Greally Literary Awards, are available from the festival website. The Munster Literature Centre is reviving its Fool for Poetry Chapbook Competition. Two winners will each have their manuscript published, receive €500 in cash and fifty complimentary copies of their chapbook. The competition is open to new, emerging and established poets from any country BUT at least one of the winners will be a debutante (with no chapbook or book published previously). 25-50 other entrants will be publicly listed as "highly commended". Manuscripts must be sixteen to twenty-four pages in length, in the English language and the sole work of the entrant with no pastiches, translations or 'versions'. The poems can be in verse or prose. An entrance fee of €20 will be charged for each manuscript. Entrants may enter more than one manuscript of 16-24 pages. The winning chapbooks will be published in August 2014 with striking cover designs, ISBNs, barcodes and will be offered for sale internationally through our own website, Amazon and selected independent book sellers. The winning poets will be considered for the 2015 Cork Spring Poetry Festival programme and have their chapbooks entered for the UK Forward Prize for best poem and anthology. The winners will be selected by a panel chosen by the management board of Southword Editions. Deadline: April 30th 2014. 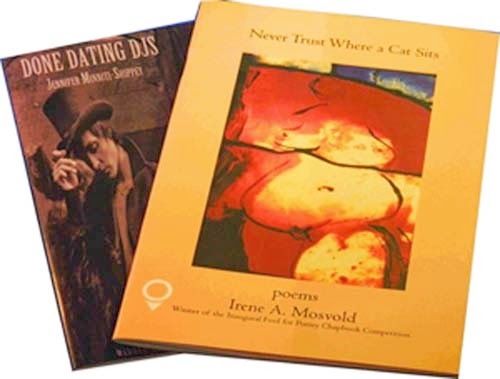 Two previous winning chapbooks, Done Dating DJs by Jennifer Minniti-Shippey and Never Trust Where a Cat Sits by Irene A. Mosvold, (pictured above) are still available from the centre for €10 post free. 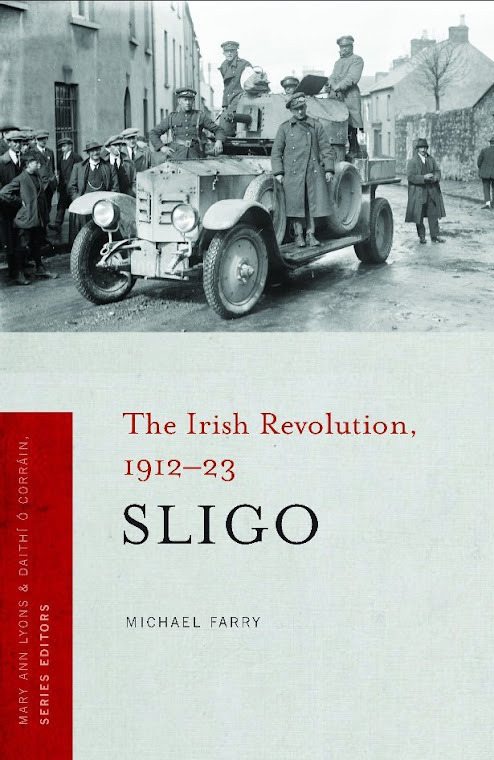 An excellent review of my The Irish Revolution 1912-1923: Sligo in the latest issue of the Irish Literary Supplement, extract above. 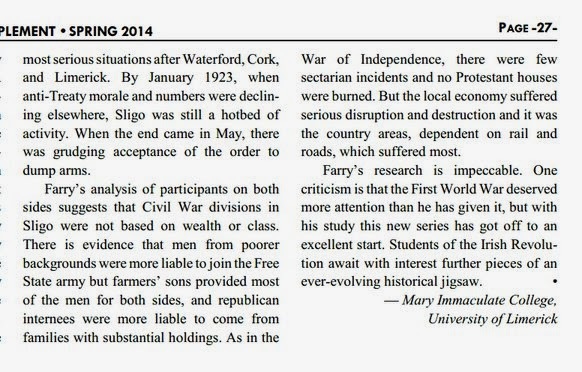 This is a twice-yearly publication of book reviews of books of Irish interest, founded in 1982. It is published in association with the Center for Irish Programs of Boston College, Massachusetts. The next volume in this Four Courts Press series of county histories of the Irish Revolution edited by Mary Ann Lyons and Daithí Ó Corráin, Tyrone by Fergal McCluskey, is due to be published very soon. My volume was of course first in the series. Carolyne Van Der Meer's Motherlode, A Mosaic of Dutch Wartime Experience was recently launched to great acclaim in Librairie Paragraphe Bookstore in Montreal, Canada. The book is published by Wilfrid Laurier University Press, Ontario, Canada in their Life Writing series and the publisher's website contains more information and you can purchase copies of the book there. Carolyne is a friend of Boyne Berries having had poems published a number of times in the magazine and making the long trip from Canada to be at the launch of our special Boyne Berries 10 issue. 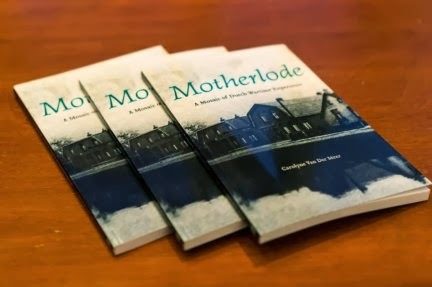 Motherlode: A Mosaic of Dutch Wartime Experience is Carolyne Van Der Meer’s creative reinterpretation through short stories, poems, and essays of the experiences of her mother and other individuals who spent their childhood in Nazi-occupied Holland or were deeply affected by wartime in Holland. The book documents the author’s personal journey as she uncovers her mother’s past through their correspondence and discussion and through research in the Netherlands. Motherlode also considers mother—daughter relationships and the effect of wartime on motherhood. Photographs of the launch are by photographer Bassam Sabbagh. More on this page on Facebook. Ó Bhéal launched the Five Words International Poetry Competition last April. Each Tuesday from April 2013 to January 2014 five words were posted online. Entrants had one week to compose and submit one or more poems that included all five words. A new set of words was posted each week. Congratulations go to Don Nixon, England, who is the winner of this inaugural competition for his poem, Fado in a Lisbon Bar. Highly commended were Afric McGlinchey, Ireland, for Frozen moment and Janet Lees, England, for A boy of six thousand parts. Among the nine poets shortlisted was Boyne Writers Group member Tom Dredge for his poem The Choice. Well done Tom! These winning, highly commended and shortlisted poems will appear in Five Words vol VII, to be launched at Ó Bhéal on Monday the 14th of April, along with an award presentation and readings from available contributors. 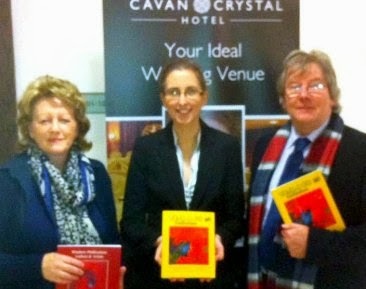 Windows Publications in association with Cavan Crystal announce details of their 22nd National Student Poetry Competition 2014. Adjudicated by Heather Brett & Noel Monahan. Entries will also be accepted on line as well as by post and from individual students as well as school entries. For email entries please send to: heatherbrett22@hotmail.com or by post to Windows/Cavan Crystal Poetry Competition, Cavan Crystal Hotel, Dublin Rd. Cavan, Co. Cavan, Ireland on or before Friday 18th April 2014 (Extended closing date) Please state which category you are entering. Award ceremony will be held in Cavan Crystal Hotel on Sunday 25 May at 3pm. It is a condition of the award that prize winners must present themselves at the ceremony before a prize can be awarded. Junior Category-Open to all students throughout Ireland and the U.K. in primary or national school education or equivalent. Senior Category-Open to all students throughout Ireland and the U.K. in second level education or equivalent. Irish Language Category - Open to all students between 10 - 18 years of age. The Irish National Teachers Organisation (INTO) is proud of its tradition in supporting the Arts and were privileged to share the company of one of our most eminent poets Séamus Heaney at the Consultative Conference on Education in Athlone in 2011. 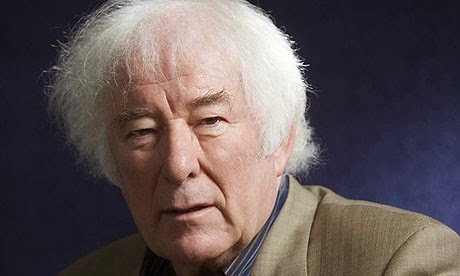 Heaney was involved in the education of undergraduate teachers as a lecturer of English in Carysfort College of Education, Blackrock, Dublin, in the 1970s and early 1980s. There is a video of Seamus Heaney reading his poem Valedictory Verses at the INTO Consultative Education Conference in 2011 on this page.. In honour of his memory the INTO, in collaboration with Poetry Ireland, is launching a poetry competition for members. All members, North and South, are eligible to submit a poem. Entries are limited to one poem per member, which can be in Irish or in English. Closing date is 31 March 2014. The decision of the judges is final. The winner will be announced at Congress 2014. The INTO will publish the winning poem in the union's publication InTouch. All entries must be accompanied by an entry form and posted to Poetry Competition, Áras Vere Foster, 35 Parnell Square, Dublin 1. Download entry form in PDF format or Word format here. The INTO and Poetry Ireland will appoint an adjudicator to judge all applications. There will be a prize of €300 for the best poem in English and the best poem in Irish, in addition to an option of spending some time in the Tyrone Guthrie centre in Annaghmakerrig. Just back from a busy two days in Galway - busy but very enjoyable. The Over the Edge on Thursday evening was great. A very large crowd in the library to hear Kate Ennals, Alvy Carragher and myself read our work. In fact Alvy performed her poems and did so very impressively. Her material was great and the delivery excellent, making it an extremely hard act to follow. Fifteen minutes is the perfect length of time to read I have decided. It's short enough to make you choose your poems very carefully, plan everything to the second and avoid digressions. I read a mixture, some from Asking for Directions and more recent ones, including one just finished. Kevin Higgins was a great compere and the audience, over 60 I think, was very responsive as you expect from a Galway audience. The fact that the library closes at eight o'clock concentrates all the readers. The open mic was, as usual, great with a fantastic variety of material. Late evening I attended the launch of the latest issue of Crannóg and the presentation of the WOW! Awards. The Crane Bar is a more intimate venue and the upstairs room was crowded. Again great readings. Crannóg 35 is a fine production, congratulations to the editorial board, Ger Burke, Sandra Bunting, Jarlath Fahy and Tony O'Dwyer. James Harrold, Galway City arts officer, presented the WOW! 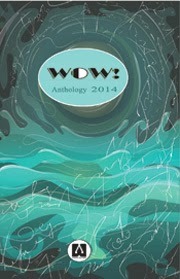 2014 awards and the anthology was on sale and can be purchased on the website. Congratulations to the WOW Award winners and runners up. Full list is on on the Wordsonthe page website.